A selection of sites, aimed at people who want to build affordable homes, has been launched at the Graven Hill development in Oxfordshire. The plots provide the option to develop up to a three-bedroom house for £230,000 via a full turnkey service, or £200,000 if you take on some of the work yourself. 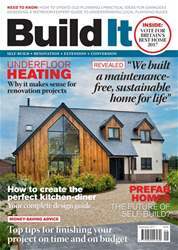 “This provides a versatile solution for those looking to selfbuild with a modest budget,” says Karen Curtin, managing director of the Graven Hill Development Company. Situated near Bicester, the scheme is the largest of its kind in the UK.